Compare Businesses - The Latest Innovation In Outdoor Laser Tag Equipment Take Advantage Of Our 14 Day Trial Program! Here at Ikon-x we understand fully that the decision to invest in a business is a difficult one for most people to make. First you must decide that starting a new business is the right thing to do for your circumstance. Then you must decide on which business is right for you. We are well aware that there are numerous businesses to choose from. The following is a comparison between mobile outdoor laser tag, paintball and indoor laser tag. But keep this in mind. Each type of business has its place in the world of entertainment. We are not saying that one business is necessarily better than another in the eyes of potential customers, we're only giving you information from a business and investment point of view. Then it's up to you to decide. Outdoor laser tag is a relatively new industry but is quickly establishing itself as a bona fide business opportunity as well as a genuine sport. Not in direct competition with paintball, but some people only play paintball and others only play laser tag because they don't like the bruises associated with paintball, but on the other hand there are plenty of people who play both. 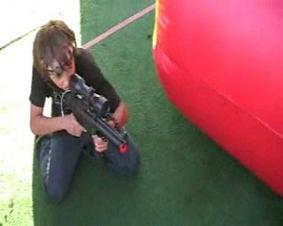 We describe mobile outdoor laser tag as a combination of paintball and indoor laser tag. Just like paintball you can play mobile outdoor laser tag in the broad daylight, in the woods or on a paintball course. But you don't have to worry about a projectile moving towards you at 280 feet per second. In other words outdoor laser tag allows you to play paintball without the paintballs. In the United States the minimum age requirement to play paintball is ten years old. In outdoor laser tag there is no minimum age requirement so your potential market increases substantially. Also, most women are very wary about being "hurt" by a paintball or by allowing their children to be "hurt" by a paintball but outdoor laser tag quells those fears because it is entirely safe. No projectile means no injury. The three major advantages of outdoor laser tag over paintball and indoor laser tag are mobility, low operational costs and low investment cost. The mobility of outdoor laser tag gives an owner the ability to set up a laser tag party virtually anywhere. Set up at the beach, in the woods, a parking lot, a football field, a park, a backyard, a ballroom, a culdesac, in the snow ... the list is almost endless. To set up a mobile paintball party is very difficult because you can't control where the paintballs go once they're shot from a paintball gun. To set up a mobile party using indoor laser tag equipment is difficult because the phasors have limited range outdoors. With the Ikon-x you don't have these problems. Operational costs for mobile outdoor laser tag are extremely low. There's no rent because you don't need a permanent location. Usually your only constant expenditure is your liability insurance premium. But if you do decide to rent a permanent location you can rest assured that a significant portion of your business will still be with mobile laser tag parties. The mobility of your business will always be a way of supplementing a permanent location. Or just allow the mobile part to be your whole business. It's entirely up to you. And lastly, low investment cost. Of course the price of investment in any business is relative to the amount of capital you have. But compared to other unconventional businesses, starting an outdoor laser tag business using the Ikon-x laser tag system is fairly inexpensive. We do recommend that you invest in at least twenty units to start your business. If you purchase twenty of our popular MP5 ABS model then your investment would be $5,980.00. Or purchase ten units now and invest in ten more later as your business dictates. Sure there are other things you could invest in with $5,980.00, but what's the return on investment and is the business already saturated? Outdoor laser tag is growing at an incredible rate, similar to paintball fifteen to twenty years ago, and Ikon-x is on the cutting edge with the Ikon-x Laser Tag Equipment. Want to be in on the ground floor of an exciting growth business? Contact Us today! The owners of Ikon-x had owned and operated a popular and successful paintball park in southern California for over six years. In the past twenty years paintball has grown from a back woods hobby to a worldwide sport. Although paintball's incredible growth rate (rate of new players entering the sport) has leveled off in the last two years, it is still a viable business. But as in most businesses unless you enter at or near the ground floor level your chances for success and significant growth are minimal. Additionally the later you enter a growth business the more investment cost will be required. In 1999 we invested $80,000.00 to build and open a thirty acre paintball park with seven playing fields. To open the same park today would cost $130,000.00 to $150,000.00 due to increased cost in property (land), insurance, permit fees, worker's compensation, equipment, supplies, advertising and competition. Something equally important to think about is saturation in a business. In our six years we've seen at least six paintball parks open and close in the southern California area. Although southern California is arguably the paintball capital of the world, there is a point where too many fields is too much. Competition for customers is fierce. But in a business like a paintball park if customers don't show up, you still must pay rent, toilet facilities, trash rental, etc. Although the paintball park business can be a lucrative one, the advantage goes to those already in the business. But if you happen to be a person who possesses enormous amounts of capital then you possess tons of options for investing. Otherwise, if you're like most people you need to be very selective when it comes to investing your hard earned money. Indoor laser tag is also a worldwide industry and has been around for over two decades. It plays similarly to outdoor laser tag with a few exceptions. Indoor laser tag requires a vest, computer software to tally scores, a dimly lit or dark room and a store front. Outdoor laser tag doesn't require these things. Indoor laser tag equipment is extremely expensive. The cost for a brand new system which includes phasers, vests, software and computers to run the software can range anywhere from $100,000.00 to $200,000.00 plus. Even a used and outdated system can easily run you $50,000.00 and up. But no matter new or used this equipment can not be used outdoors in the daylight. Rent on an indoor laser tag facility usually runs higher than rent on an outdoor paintball park, and with less space to operate. And just a reminder, rent must be paid even if customers don't show. Although indoor laser tag has definitely established itself as a viable business, an investor must have large amounts of capital usually in the range of $250,000.00 to $300,000.00. Twice the amount of investing in a paintball park.